With the ZXP Series 1 ID card Single-sided full colour or monochrome printer, Zebra enters an extremely compact desktop printer into the running, one which will particularly impress with its price tag. With a minor investment you secure yourself high performance and good quality card prints for membership IDs, name tags, business cards and ID cards. 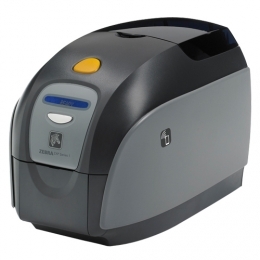 Zebras ZXP Series 1 scores particularly well in areas where there is a long-term need for individualized card printing on demand, but at the same time, without large print volumes. It is the ideal market-entry card printer. For visitor IDs, membership IDs, customer cards, etc. Personalized or designs covering the entire card are generated by the ZXP Series 1 desktop printer within seconds, in either monochrome or full colour depending on the colour ribbon, according to requirements. It prints single-sided cards with a resolution of 300 dpi 12 dots/mm via sublimation or thermal transfer process, as you wish. The advantage of dye sublimation lies in the longer durability of the printed image on the card depending on the corresponding colour ribbon. The printing process is particularly suitable for customer loyalty programs in retail, for employee ID cards at access control points, or for affordable visitor or membership IDs. In order to generate multi-functional cards with encodable magnetic stripes, you optionally receive a version with an integrated encoder. The maximum print speed of up to 545 monochrome cards, or up to 130 full colour cards per hour guarantees quick processing, even during short notice peak times. In order to be best prepared for the varying areas of application, Zebra offers plastic cards of various thicknesses. The ZXP Series 1 processes different cards with a thickness of 0.25 to 1.02 mm. The matching Load-N-Go colour ribbons from Zebra are quick and easy to change. Additionally, they are environmentally friendly thanks to less plastic and more biodegradable materials. Because of its automatic colour ribbon calibration, problem-free operation is made as easy as possible. Even inexperienced users will find its handling easy. Status and error messages are directly shown on the 16-character LCD display. Connect the ZXP Series 1 standard via USB port easily and quickly - the cable is included in the scope of delivery. In order for several computers or offices to access the printer, choose the optional Ethernet port to turn it into a network printer - even after purchasing, and directly on-site. To call up online printer documents, or to read the printer address with a mobile device, the ZXP Series 1 features an integrated NFC chip Near Field Communication.